Why do you celebrate Earth Day? At All In Energy, we take the day to reflect on all the beauty Earth has to offer and what we’re doing to protect and celebrate it. We, in collaboration with the Boston Affordable Energy Coalition, will be celebrating our community and our Earth at the Love Your Block: Earth Day Party. Join us on Saturday, April 27th from 9am-2pm at Codman Square Park to learn about how the community is building a sustainable future right in Codman Square. Learn about the neighborhood’s urban farming initiatives while taking a tour of the Nightingale Community gardens. Hear from community leaders, officials and activists; and explore the green initiatives happening in Dorchester and throughout Boston. Make sure to stop by the All In Energy table, and learn about how we’re working to raise awareness of Massachusetts’ energy saving programs in your neighborhood. We want all residents to access the benefits that they already pay for through their utility bills. Come say hello, and learn how you can save energy and money by signing up for a home energy assessment. View the event schedule and RSVP here. There will be free food, music and activities. We hope to see you there! In the meantime, log onto our website or contact us at info@allinenergy.org for more information about a home energy assessment and its benefits. Women have been the driving force behind many of history’s greatest inventions, innovations and movements. In fact, if you tried to go a day without using things invented by women, you might find your day to be pretty difficult. Despite their essential contributions to society, female leaders are often not recognized at the same rate as their male counterparts. In honor of Women’s History Month, we’re thinking about the influential ladies of yesterday and today who often go unnoticed. At All In Energy, it’s a part of our mission to recognize and develop female leaders in the clean energy workforce. With our talent pipeline, we hope to increase the current 30.1% of women employed in the Massachusetts clean energy workforce. ​Learn more about Tamika here. Reverend Mariama is a pastor, activist, artist and facilitator working to build social movements. She serves as a pastor at New Roots AME Church in Dorchester, a Faith Fellow for the Green Justice Coalition and the Minister for Ecological Justice at Bethel AME Church in Roxbury. She advocates for ecological and social justice as well as youth engagement. Much of her work debunks the idea that people of color don’t care about climate change. Reverend Mariama leverages her impressive network to encourage collaboration among folks of different races, ethnicities and religious affiliations in the fight against climate change. She holds many notable achievements at the grassroots level, including successfully lobbying the AME Church to adopt a resolution on climate change, making it the first historically black denomination to do so. Reverend Mariama is highly decorated, having received awards from the Barr Fellowship, the Celtics Heroes Among Us, The Roxbury Founders Day Award and the Boston NAACP Image award. She believes that this climate crisis will encourage collaboration among the races in combating other social issues and in bridging Boston’s racial divide. ​Follow Reverend Mariama White-Hammond here. Dr. Martin serves as the CEO and Founder of All Aces, INC., a social enterprise that helps people, communities and organizations address difficult situations and topics, and a Distinguished Senior Fellow at Northeastern University’s Global Resilience Institute. She was the first Chief Resilience Officer for the City of Boston where she advocated for racial equity, social justice and social cohesion in the face of climate change. Dr. Martin has also served as the Director of the Office of Public Health Preparedness at the Boston Public Health Commission where she was responsible for coordinating public health, healthcare and community health preparedness; emergency management coordination among the public health and healthcare system; psychological trauma response coordination; and education and training. She has extensive experience in public service and serves on the advisory board of All In Energy, providing feedback, advice and helping us build connections to advance a more inclusive clean energy economy. ​Learn more about Dr. Atyia Martin here. About two weeks ago, Representative Alexandria Ocasio-Cortez (D) of New York and Senator Ed Markey (D) of Massachusetts presented a resolution for the Green New Deal. Among many other things, this plan aims to make the U.S. carbon neutral by 2030. According to the representatives, achieving the goals outlined in this deal will require lots of manpower as well as support from the federal government. Ultimately, programs from the Green New Deal will provide, in the most equitable way, both societal and financial benefits to those who make the switch to clean energy. While some might argue that all efforts should be towards optimizing resources fully for reductions in greenhouse gas emission, it is important to ensure that this plan is delivered with the intention of benefiting all communities. Studies show that there is a significant racial disparity when it comes to clean energy access. According to census data, areas with over 50% Black or Hispanic populations receive significantly less domestic solar panel installations than white-majority areas. Past research has attributed this to differences in income and homeownership by race and ethnicity. A recent study has shown that this disparity remains even when accounting for these differences. Researchers are still trying to figure out the relationship between race and ethnicity and clean energy adoption. Much discourse surrounds the ideas of seeding and social proof. Basically, if someone in your community has solar or takes advantage of local clean energy resources, like the Mass Save energy audit program, then you are more likely to do the same. The idea is that everyone’s doing it, so you should to. ​All In Energy works to bridge this gap and bring clean energy to underserved communities. We’ve joined forces with our community partners to raise awareness of Massachusetts’ clean energy programs and ensure that residents of Dorchester, Roxbury and Mattapan are accessing benefits that they’re already paying for. We’re striving to bring energy savings to underserved communities while growing diversity in the clean energy workforce. ​We’re excited about the Green New Deal and the potential it has to benefit all residents. It is our hope that an adequate amount of attention and resources are spent to ensure that underserved communities, specifically communities of color, benefit from these programs. Read the Green New Deal here. ​It’s Spring semester, and we’ve welcomed four new members to our team! They’ll all be working to further the mission and story of All In Energy, but what’s their story? A California-native, Camille misses the temperate weather of her home state. She moved to Boston from the Golden State to study Communication at Boston University. Camille is in her final semester of undergrad and is looking forward to putting what she’s been studying into practice. At All In Energy, she is responsible for reaching the communities we serve through digital and direct marketing. With our organization, she hopes to further explore social justice issues as they relate to climate change and bring awareness to them through communications practices. ​All In the Community: Camille loves to visit and photograph the Arnold Arboretum on a sunny day. ​From Andover, Ian is currently attending Umass Boston where he studies Environmental Policy and Management. His role at All In Energy allows him to apply his current studies in conducting community outreach and educating residents about energy efficiency. This semester, Ian hopes to establish himself in the environmental industry and further develop the skills necessary to become an organizer. ​All In the Community: Ian enjoys going to concerts with friends at one of Boston’s many music halls. A huge soccer fan, Mamadou is from Guinea. He recently received an associate degree from Bunker Hill Community College and is working on transferring to a four-year institution. Mamadou works with fellow intern Ian in conducting community outreach and spreading awareness about energy efficiency. He is passionate about expanding renewable energy access to people in developing countries, particularly Guinea. With All In Energy, he hopes to gain the skills necessary to pursue this passion. ​All In The Community: Mamadou enjoys going to live events, including concerts and sports games. ​Jared recently relocated to Dorchester from Herndon, Virginia, a small town on the outskirts of D.C. He received a B.A. in Energy Engineering from Penn State and worked as a director for a canvassing office in D.C. With All In Energy, Jared works with community leaders in Dorchester, Roxbury and Mattapan to ensure that residents are benefiting from the Mass Save and ABCD energy efficiency programs. He is most excited to connect people from underserved communities to well-paying jobs in the clean energy sector. ​All In the Community: A newbie to Boston, Jared is exploring the city’s many sites and shows. His favorite so far has been attending an ImprovBoston show. The internship experience at All In Energy was an amazing learning opportunity for me. I have discovered my passion for climate justice and clean energy access. The experience helped me learn about the industry, the available programs, and the gaps within the industry that needs to be filled. It was very rewarding to engage with residents to connect them with energy saving programs. Also, connecting with other individuals working within their communities and clean energy industry helped me gain an insightful overview. All the people I have met inspired me to aim to work in a mission-driven environment. It was great working with and learning from Gabe and Rouwenna. Collaborating and working with two other brilliant interns, Natalia and Olivia, was a wonderful opportunity as well. I am truly thankful for all the experience I have gained by working with All In Energy. I have had such a valuable experience with All in Energy this fall. My experiences working in the field, collaborating with partners such as Neeeco, and working with the All in Energy team have led to both professional and personal growth for myself. I also had the chance to speak to dozens of people in the community about energy assessments and was able to sharpen my communication and sales abilities. As an environmental studies and economics student just starting out in this field, entering this internship I hoped to gain some guidance in what direction I want to go in with my studies and career. Through the past few months, I have learned the value of mission based work from Gabe and Rouwenna, which is something I am so grateful for. I was able to see how strong of a motivator improving the community can be, and the great payoff when I encountered people at events who were pleased with our services. As a sophomore, I still have experimenting to do through more internships in this field, but All In Energy has opened my eyes to a multitude of possibilities through my work here. I am so excited to see what Gabe, Rouwenna, Natalia, and Serra accomplish in the future- I am inspired by each of them and know they will keep doing great things! My experience at All In Energy has been overwhelmingly positive and insightful. This semester, my role as a community outreach coordinator had me in between the office and the field. While in the office, I was reaching out to residents to sign them up for energy saving programs, reaching out to community organizations and businesses, and doing research and other miscellaneous items for the team. In the field, I engaged with residents to sign them up for programs and created connections in the communities with leaders and activists. Both parts of this internship have allowed me to learn about what I want in a future career, and I've realized that my favorite part is being in communities engaging with people and having meaningful conversations. The biggest takeaway I've had from this internship has been how much I've enjoyed the community engagement piece, and I plan to use this insight to help me find internships and jobs that are well-suited for me with similar responsibilities. I've also learned that I'm really passionate about social justice, and I want to further explore the intersections between social justice and environmental issues. Next summer when I'm pursuing new internships I plan on exploring these intersections, and I would really like to try working for a more activism or organizing-focused organization. I also hope to take courses in the future that are related to environmental justice, because I would really like to learn about the concepts and theories behind it. Overall, working at All In Energy has given me insights into both my personal and professional interests, and I'm so grateful to have had the opportunity to work at a company at the forefront of helping Boston tackle climate change and inequality. 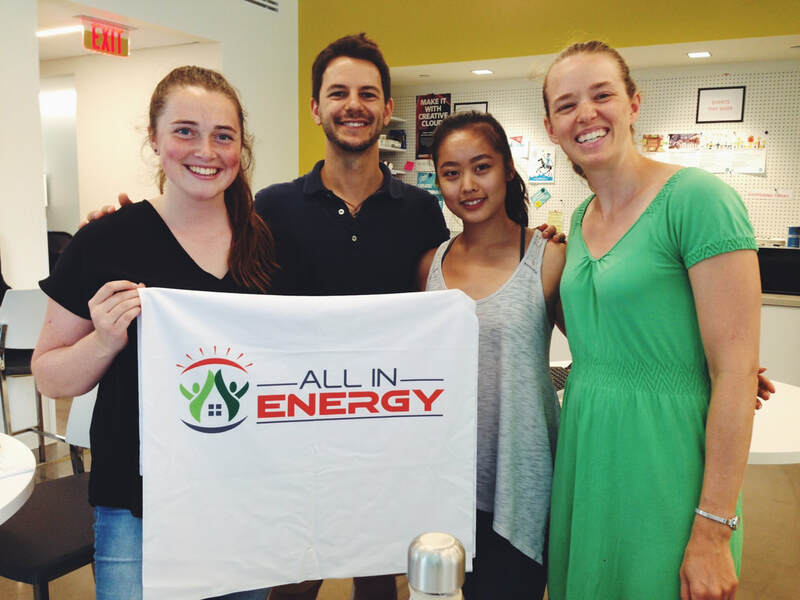 This Fall, we have three new interns that have joined the All In Energy team to push the mission to bring energy savings to underserved communities and grow diversity in the clean energy workforce. Read below to get to know the fall intern team to learn about who will be helping out this fall! Olivia on a ski lift at Sugarbush in Vermont. I am from Westfield, NJ, and am super excited to work with All in Energy to get involved with communities in Boston and learn more about energy efficiency and environmental justice. This semester, I hope to serve the community while improving my social development, marketing, and outreach skills. As an avid skier, runner, and hiker, I have always had a passion for the environment, and this is the first opportunity I have had to apply this interest in an internship. I am currently a Sophomore at Northeastern University and am pursuing a degree in Economics and Environmental Studies with a minor in International Affairs. In my free time, I host a radio show on WRBB 104.9 and write for NU Sci, Northeastern's student-run science magazine. Natalia hiking in the White Mountains. I am originally from Annapolis, MD, and I'm currently a junior at Boston University studying Environmental Analysis and Policy with two minors in Economics and Biology. I have always loved being outdoors and have been interested in environmental issues, but it wasn't until I went on an alternative spring break trip my freshman year at BU to Tennessee to build hiking trails that I really found that this was the field I wanted to go into. I love learning about the intersections between people and their environments, and the amazing things people around the world are doing to help adapt to and mitigate climate change. I'm super excited to be working for All In Energy because I think our mission to help transition to an inclusive clean energy economy is vital to helping us combat climate change and social inequalities. I hope to later start my career in a similar company that allows me to tackle these issues simultaneously as well. In my free time, I love reading, hiking, exploring Boston, traveling, and walking dogs! Serra on a motorcycling trip through the European Alps! I am a communications major student from Bursa, Turkey. I am currently a student at Bunker Hill Community College. I will be transferring to another institution next semester. I can't wait to graduate to help people become environmentally conscious and take actions to become more sustainable. Turkey's abundance in natural richness has made me environmentally conscious. I love taking long walks and hiking through beautiful state parks and mountains. I love traveling as well. Visiting naturally beautiful countries have led me to take actions to be more sustainable. I want to be a person that helps preserve our planet's beauty. Being a part of a non-profit organization like All In Energy is very exciting. I am motivated to help residents take sustainable actions. Having a strong first step into the industry with All In Energy is going to be rewarding. I would like to have a good presence as a woman in the clean and sustainable energy industry. This fall will be the very first exciting step towards my goals. As we begin to wrap up our first summer with the Boston community, our interns Kelly, Kim, and Pedro each took a moment to reflect on their experience working with All In Energy. Each is headed back to school this fall: Kelly entering her junior year at Bentley University, Kim entering her junior year at Brandeis University, and Pedro entering into the final push for his MBA at Boston University. Keep reading to see what each has to say about their summer working towards a greener and more equitable Boston. (From left to right) Kim, Pedro, Kelly, and Rouwenna at the BUild Lab with the new table runner! For the summer of 2018, I had the opportunity to be a part of All In Energy’s team. I chose to get involved rather than pursuing other internships because I believe in the statement that poverty and inequality have no borders. This applies to anything and everything related to social impact, including climate change and energy efficiency initiatives. I was drawn to the idea of being a part of a starting venture, getting the chance to pitch in from the strategy to the execution and launch of starting operations, always learning throughout the whole process. The interaction with the BU entrepreneurial hub, its workshops and its applications on the field, allowed me to see, tangibly, theory put in practice. The experience and drive from the leading founders, Gabe and Rouwenna, is another takeaway from the summer. Having proximity to all of the other aspects of an organization let me see where my strengths lay and where there is a clear opportunity to grow and learn, such as platforms, tools, marketing, etc. Having had previous experience in finance, engineering, and participation in social impact, I am confident that I have continued to build up skills to contribute knowledge and qualifications, as well as passion to the world of social and economic improvement. The summer with All In Energy has definitely shown me the overlap of entrepreneurship and the need for impact ventures. The startup atmosphere and the need for continuous evolution to include society as a whole, as well as all of its stakeholders from the most to the least vulnerable, has drawn me closer to follow a professional career in that sector. Special thanks to All In Energy for the friends made, relationships and experiences. I am truly grateful for the opportunity I had to work with All In Energy this summer. I have learned a lot about all sorts of business workings, like the nature of nonprofits, fundraising, community campaigns, and more, but what I most value is the experience of being in such a mission driven environment, and the opportunity to connect and form relationships with such a diverse Boston community. It really made the change that I have always believed needs to happen that much more real and more important to me. As a junior in college, I am still exploring what I might like to do as a career, but after working with All In Energy this summer it has become most clear to me that I want to inspire work aimed toward making an impact and really helping the community. Many thanks to all those who had a hand in making this the summer experience that it was, especially Rouwenna and Gabe. I wish the best of luck to you both and know that with your drive and expertise you will surely be an inspiration to many and succeed in making the world a better place. I had an amazing experience with All in Energy over the summer of 2018. The mission and goals of the company have motivated me to take proactive steps to further my future endeavors and incorporate sustainability measures in all sectors. The idea of going into a startup was nerve wracking as well as exciting, but coming out of the summer I gained new friends and experiences that would have never occurred if I went traveling instead. Gabe, Rouwenna, and the BU Accelerator program guided me through the ins and outs of a start up and the hardships as well as the breakthroughs that come with it. These lessons were something I could never gain from reading a textbook. Seeing the amazing startups around me have motivated me to always go above and beyond what is expected. This summer was truly an amazing experience and I thank All in Energy for all of it. I am excited to see what All in Energy will do in the future! Want to see what we're do in the future? Subscribe below for weekly updates! We are so excited to announce the kickoff of Codman Square $aves Energy! We are partnering with the Codman Square Neighborhood Development Corporation (CSNDC) as well as local houses of worships and businesses to connect Codman Square and Dorchester residents like yourselves to great no-cost home energy efficiency programs that can help lower your utility bill. Plus, it is a great way to make your neighborhood more energy efficient, which is definitely something you can brag about! Catch up with us at local Dorchester events like the Family Fun Night in Elmhurst Park, at the Codman Square and Upham’s Corner Farmers Markets, and Beach Day at Malibu Beach, Boston! Follow us on Twitter @allinenergy for daily updates and for more information on where we’ll be. 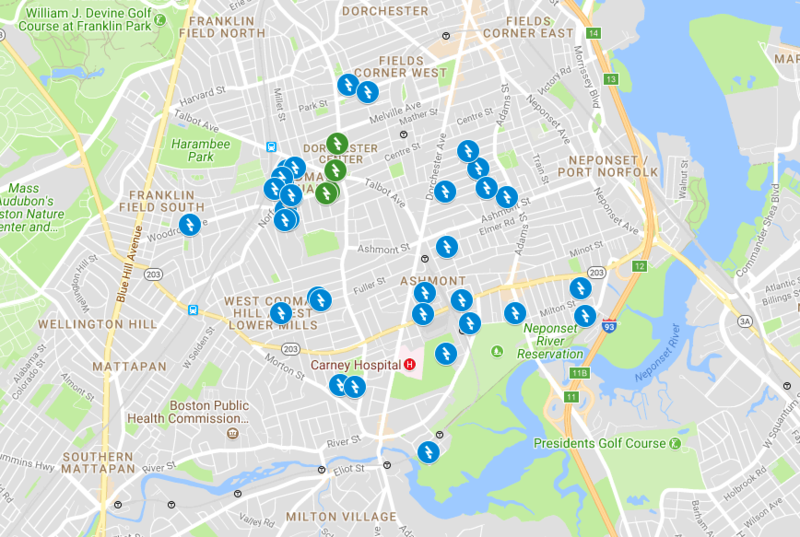 Check out the map below of all of your neighbors who have already begun saving by completing a no-cost home energy assessment (also featured on our Codman Square $aves Energy page). At the assessment they received installation at no cost of LED light bulbs to replace incandescents, programmable thermostats, advanced powerstrips, and more. Get more details or sign up here. Subscribe below for weekly content!